If trekking into town to stand at the back of the crowds failing to see any of the Jubilee celebrations doesn’t take your fancy, or perhaps you’re staging a republican boycott, there’s plenty to do in Leytonstone this weekend, and it’s not so far to get home if (I think, when) it rains! The Woodhouse Players have their production of Honour at the Welsh Church Hall by the Green Man on Friday and Saturday (and again next weekend). There’s always something lively happening at the Luna Lounge, and What’s Cooking at the Birkbeck Tavern, there are street parties, some of which are listed on the Queens Jubilee page. Not to mention the many other pubs and restaurants in the Leytonstone area. The Lion Heart Market will be outside the Red Lion pub again on Monday and Tuesday, with the market on Monday and Tea Party on Tuesday. Take a look at their new website which I helped them set up: Lion Heart Market. The Red Lion itself is having a weekend of fun with its ‘Right Royal Knees Up’. A new exhibition What’s Going On, opened at the Stonespace gallery this week and St John’s Church has a Bank Holiday Open Day on Monday, including a chance to climb the Tower. It’s also the final day of the Leytonstone Museum exhibition of photographs in Leytonstone library. 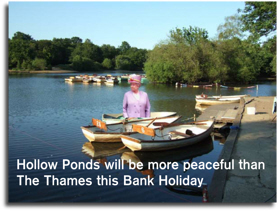 If the weather holds out a rowing boat on Hollow Ponds, lunch from the Lakeside Diner or Log Cabin or a drink and a meal at the Sir Alfred Hitchcock hotel make a relaxing day out. Just when you think the Bank Holiday is over, Leytonstone Film Club are screening Mid August Lunch on Wednesday 6 June 2012 at Leytonstone Library. Have I missed mentioning your event? Add it at the bottom of the Queens Jubilee page. Whatever you do, have a good Bank Holiday. ← Are you organising a Jubilee street party in Leytonstone? It’s also the final day (Saturday, 9am-6pm) of the Leytonstone Museum photographic exhibition in Leytonstone Library.